The European herring gull (Larus argentatus) is a large gull (up to 26 in (66 cm) long). 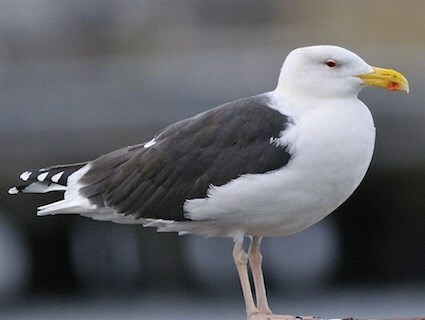 One of the best known of all gulls along the shores of western Europe, it was once abundant. It breeds across Northern Europe, Western Europe, Central Europe, Eastern Europe, Scandinavia and the Baltic states. Some European herring gulls, especially those resident in colder areas, migrate further south in winter, but many are permanent residents, e.g. in the British Isles, Iceland, or on the North Sea shores. 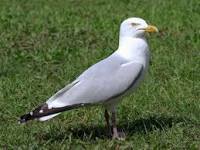 European herring gulls have a varied diet, including fish, crustaceans and dead animals as well as some plants. While herring gull numbers appear to have been harmed in recent years, possibly by fish population declines and competition, they have proved able to survive in human-adapted areas and can often be seen in towns acting as scavengers. The male European herring gull is 60–67 cm (24–26 in) long and weighs 1,050–1,525 g (2.315–3.362 lb) while the female is 55–62 cm (22–24 in) and weighs 710–1,100 g (1.57–2.43 lb). The wingspan can range from 125 to 155 cm (49 to 61 in). Among standard measurements, the wing chord is 38.1 to 48 cm (15.0 to 18.9 in), the bill is 4.4 to 6.5 cm (1.7 to 2.6 in) and the tarsus is 5.3 to 7.5 cm (2.1 to 3.0 in). Adults in breeding plumage have a grey back and upperwings and white head and underparts. The wingtips are black with white spots known as "mirrors". The bill is yellow with a red spot and there is a ring of bare yellow skin around the pale eye. The legs are normally pink at all ages but can be yellowish, particularly in the Baltic population which was formerly regarded as a separate subspecies "L. a. omissus". Non-breeding adults have brown streaks on the head and neck. Male and female plumage is identical at all stages of development, however adult males are often larger. Juvenile and first-winter birds are mainly brown with darker streaks and have a dark bill and eyes. Second-winter birds have a whiter head and underparts with less streaking and the back is grey. Third-winter individuals are similar to adults but retain some of the features of immature birds such as brown feathers in the wings and dark markings on the bill. The European herring gull attains adult plumage and reaches sexual maturity at an average age of four years. Young birds have scaly black-brown upperparts and a neat wing pattern. They take four years to reach maturity. Identification from juvenile herring gulls is most readily done by the more solidly dark (unbarred) tertial feathers. The call is a "laughing" cry like that of the herring gull (to which this species is closely related), but with a markedly deeper pitch. Infest-a-Cure Ltd / Trading As Rest Assured Pest Control, Registered in England and Wales Company Registration Number 06610444 Office: 253b Chingford Mount Road, Chingford, London E4 8LP Telephone: 020 8616 6782 Email: info@infestacure.co.uk .